Fire swept past Camp Mountain Chai, smoke and soot damage left a stench in the air. Trees were down and damaged. Orange Restoration San Diego helped the camp’s staff to safety. A team of more than 30 fire damage restoration experts moved into Camp Mountain Chai near San Diego this summer to clean up smoke damage and other ravages left behind by the Lake Fire. While the camp was spared from destruction, an exceptional effort was required to save the season and put things in order at the popular Jewish camp. 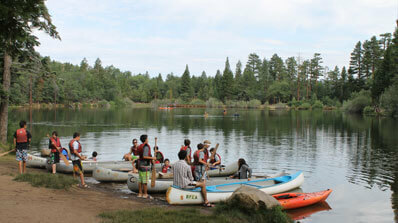 The camp’s staff was preparing for the first summer session when the wildfire threatened their safety. Staffers were evacuated so quickly that most left personal items behind to escape as rapidly as possible. With the location in the San Bernardino Mountains unusable and under threat, the first summer session was moved to Camp Scherman in Idylwild, owned by Girl Scouts of America. As the fire swept past Camp Mountain Chai, smoke and soot damage left a stench in the air. Trees were down or damaged, and the soot’s acid nature threatened the camp’s facilities. A lot of work would have to be done before the camp could reopen. The smoky smell and soot-covered surfaces are both unpleasant and potentially dangerous for campers and staff. Orange Restoration owner Yaron Lief, who grew up going to camp at the facility, stepped forward. He volunteered to have a look at the damage and see what could be done. Damage was extensive enough that an insurance claim was filed to cover most restoration costs. Since quick action was needed, Lief move more 30 employees into the camp to live like campers and work in three shifts to efficiently and thoroughly decontaminate cabins and facilities before the second summer session was scheduled to begin. “We immediately mobilized all available equipment, supplies and personnel to save camp Mountain Chai after the fire. It became like a Jewish mission to ensure the reopening of the camp in time for the next session so that we could make sure that the kids enjoyed the summer that was planned for them,” Lief said. “For me it was a very special experience. Belonging to the community and going to this camp numerous times in my past made this an important Jewish mitzvah and mission that needed to be accomplished for Jewish kids and for the community as a whole,” he said. The goal was to restore these isolated and remote buildings in a burned forest to pre-loss condition, meaning that there could be no smoke odor inside any buildings. That process started with removing all contents from the buildings. Then, the buildings were sealed with containment barriers. Gas machines were used to eliminate much of the odor, plus a great deal of hand work was required to decontaminate the kitchen, the dining hall, the infirmary and all the outdoor structures. Working with camp director Zim Zimmerman, the team set priorities and worked through them, some concurrently, until both crucial and less crucial priorities were met. In the end, the smoke damage restoration work was completed early — two days before the second session of campers were due to arrive. Lief said he and his team were fortunate to be able to experience the magic of camp. Sleeping in bunk beds and eating in the camp kitchen helped strengthen and bond the already close-knit Orange Restoration team. Once the work was done at this Jewish camp, Orange Restoration went on to handle restoration work at other nearby camps. The company handles all types of fire damage, water damage, mold remediation and similar restoration services around the San Diego area and beyond. In need of some major or minor restoration work? Time is of the essence to avoid further damage! Call Orange Restoration right away and we’ll have specialists give your situation a thorough inspection with cost-effective recommendations. All of our technicians are fully certified and trained in all facets of damage restoration. We will respond quickly and get your property back to its original state in no time at all. We are available for 24/7 emergency services. Give us a call today!